Great News! LeMay Museum Breaking Ground! It's a day that myself, the other volunteers and a good number of others have been looking forward to for a long time. The Museum is breaking ground on its new location next to the Tacoma Dome! The date is set for Thursday, June 10th, starting at 3 pm at the Tacoma Dome with a after party at the Museum's Fife location from 5 - 8 pm. If you are interested in attending the after party they are asking that people RSVP. It will be a lot of fun and the approximate finish date for the new Museum is sometime in 2011! So if you are in the area and are available at that time it would be great if you could make it. On LeMay's website you can see pictures of what the Museum is going to look like after it is finished. Just wanted to share the exciting news! 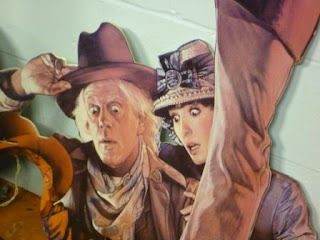 Their mission.... To have fun and cause a little laughter in the room! Sunday was the Museum's Volunteer Picnic Driving Tour. 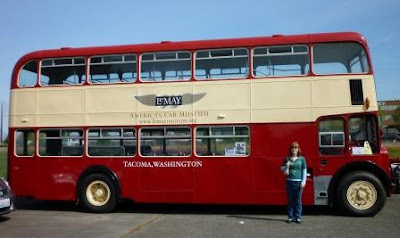 Although I did not make it to all of the stops, which included the a motorcycle museum in Spanaway, the Museum's Fife location and a private car collection up towards Puyallup, I did get to come to the last stop back at Marymount for games and a picnic lunch. It was great to meet new people and get to know the names of some of the people I have passed by and never got the chance to talk to. The games were fun too- I "won" a baseball cap and later was given, there were many prizes left over, a poster of a nice looking race car (not particularly sure what kind it is though). 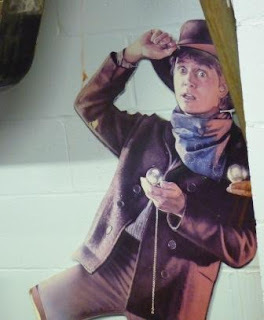 The games were based off the television show, which I have not seen, called "Minute to Win it." I was with the starting group that participated in the first game, our team's mission was to pull out all the tissues from a tissue box in under a minute using one hand and only pulling them out one at a time. My forearm was indeed sore afterwords but I enjoyed it. Later games including shaking ping pong balls out of empty tissue boxes that were strapped to the participants backs, dipping your nose in Vaseline then getting cotton ball with it and transferring them to a bowl about three or four feet away, stacking cups in pyramid formation (one handed) and then taking them down by using one cup to collect all of them by collapsing them and taking a measuring tape to get a ping pong ball into a bowl about four feet away ( more difficult than what it seems). The gymnasium filled with laughter and encouragement with each game. It was a very enjoyable experience to say thank you to all of us volunteers and I hope that next year I can make it for the tour portion also. p.s. 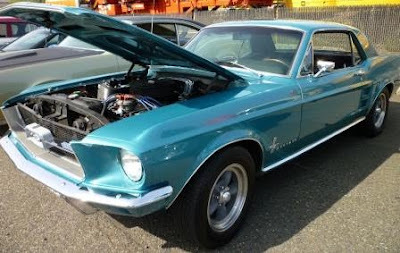 On another note in the life of this car novice - On Friday I was pleasantly surprised to have one of the volunteers give me a collector car magazine that is suppose to be like the bible of collector car magazines, Hemmings Classic Car. This was really very sweet of him, he had finished reading it and knows that I am trying to learn more about the cars. I look forward to reading it and maybe passing on the information if I find anything really striking about some of the cars. So last week I went to not only a car show at Clover Park Technical College but I also went to the first Coffee CruiseIn at LeMay Museum's Fife office. It was really a great time. I got to see a few friends that I haven't seen in a while at the Fife location. I also learned something about myself since I have volunteered at the Museum, I have gained a appreciation for classic cars. There was one particular car that was all "tricked" out with special things and I realized that while it might be "cool" and high performance it just doesn't have the artistic flair that some of the older cars have. 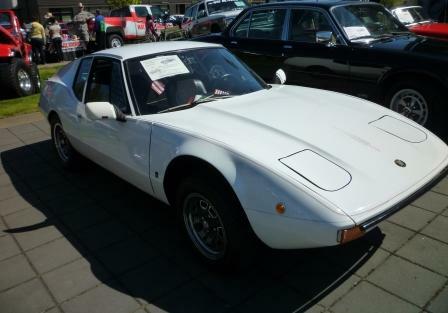 This is the car that I previously was talking about. 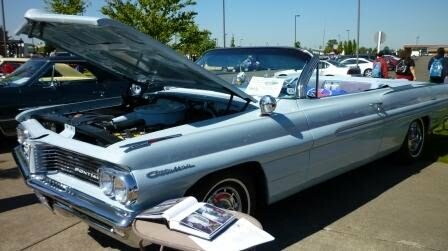 But here are some of the cars (some classic, some maybe not) That I saw at the car shows. While I have learned that I don't particularly care for some tricked out cars appearances, some pieces can be added to the classics that make me smile ( Note the wind up key in the back). I had to get a picture with the LeMay double decker bus! 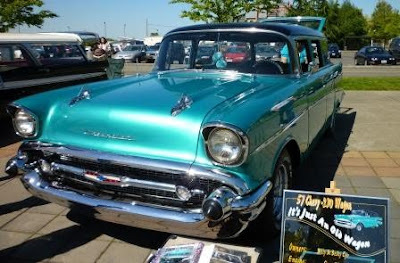 And now some nice cars that were at LeMay Museum's Coffee Cruisein at their Fife location. I hope you enjoyed the pictures of the cars! If you are in the area of Tacoma next time there is a Coffee CruiseIn ( It's a monthly event) I highly recommend it. Tell them Amber sent ya! 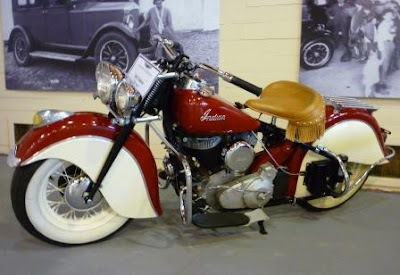 The 1947 Indian chief was produced by the Indian Motocycle Company and for those that caught the seeming spelling error, yes that was how the company spelled its name. Its original co-owner Oscar Hedstrom was apparently familiar with the fact that Italian motorcycles names started with "moto". 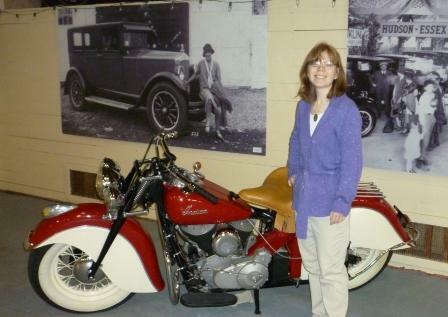 I was excited to find out that this motorcycle was in the Museum's collection. I had recently gotten a very good documentary on Harley-Davidson motorcycles and they discussed the rivalry between the Harley-Davidison fans and the Indian fans and discussed the company's history. 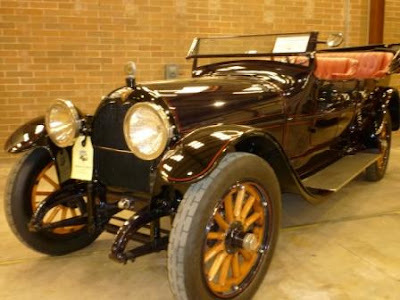 It was started by a champion bicycle racer, Oscar Hedstrom and a brilliant engineer, George Hendee, in 1901. 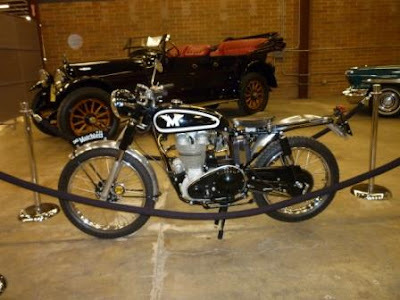 The original owners decided to leave the company in 1916 and the company suffered years of mismanagement afterwords until the company was bought by Paul Du Pont who not only loved motorcycles but also knew how to run a business. The Indian Chief motorcycles were started in production during Du Pont's time of running the business in 1940. It was also the first motorcycle to have a "stream lined" design which meant making it look fast even when standing still. I can't believe that when these beauties first came out dealers were actually throwing them away because people did not like them at the time! The stream line designed was viewed by the consumer at the time to be extra and unwanted metal. I thoroughly wish that I had a time machine to go back and buy one of these when they were unwanted, particularly a 1940 one when they just came out. 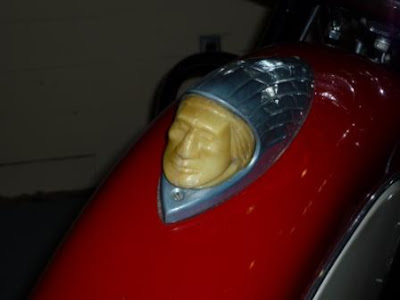 Something that I thought was only like a car hood ornament, this Indian head was actually both a emblem for the company and a running light. This particular one at LeMay - AMERICA'S CAR MUSEUM is a 1947. This was when the company was under the leadership of Ralph Rogers - the man that has been accused of killing the company as its doors closed just a few years after he was put in charge. His timing for new advancements in the motorcycles were bad, even though his concepts were good, and the company shut down in 1952. 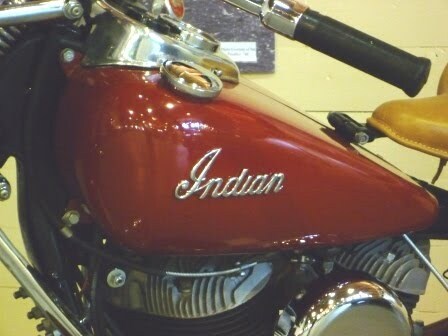 However, the Indian Chief was the one tried and true model that the company sold continuously until it closed. I highly recommend the documentary "Hog Heaven - The Story of the Harley-Davidson" that the History Channel did. I learned a great deal about the history and beauty of motorcycles and it was a lot of fun to watch. You can currently see this classic at LeMay - AMERICA'S CAR MUSEUM in Tacoma, WA. Tell them Amber sent ya! 'Til next time have a great day everyone! 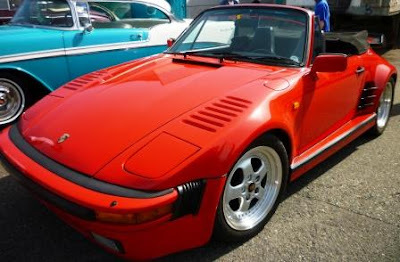 One experience sitting halfway in the car ( I didn't want the the carpet to get dirty with my boots that I wore for that day) and a little knowledge later I now have a new appreciation of this classic car. 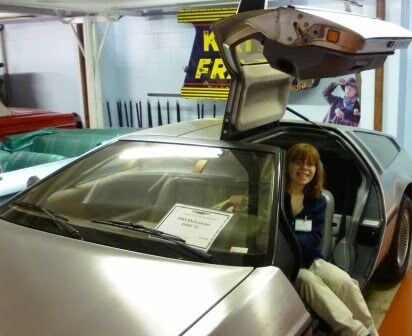 It was built by the Delorean Motor Company. 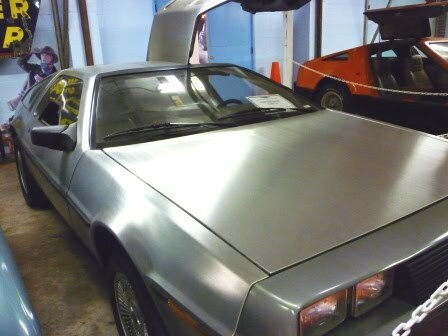 The company was started by John Delorean, the Division Manager of Pontiac, and the cars were built in Belfast, Northern Ireland from 1980 to 1982. It was in 1982 that the factory was shut down. The cars featured "gullwing" doors - a new concept for me when I first saw this car as a child in the "Back to the Future" movie. The body is brushed stainless steel and the way to clean this car is with a scotch pad or similar product. The engine is located in the back of the car, something that seems unusual to me because of the how the car is built. It has135 horsepower which was average for the time according to Jay Leno. 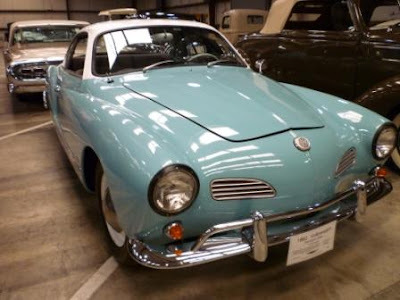 The car was not known for its great performance but it was known for its Gullwing doors and the fact that it did have that "from the future" look to it. The weight distribution was 68 percent in the back and 32 percent in the front so it could be tricky on corners. My impression of the car is that it is very comfortable to sit in but one should be careful of their head as to not hit it on the frame of the car as they climb in, when this happened to me the Museum's volunteer coordinator made it sound as if a lot of people hit their head on the the front corner of the window. The windows for me seem a bit claustrophobic because they are so small, but maybe that's just me. 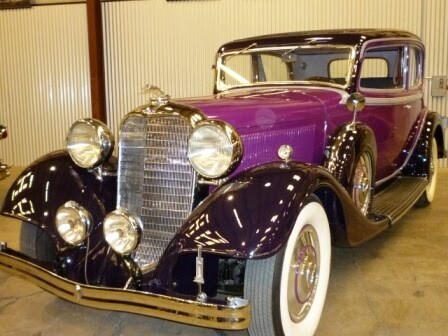 But over all it seems to be a very cool car despite some of the bad reports I have heard about it. 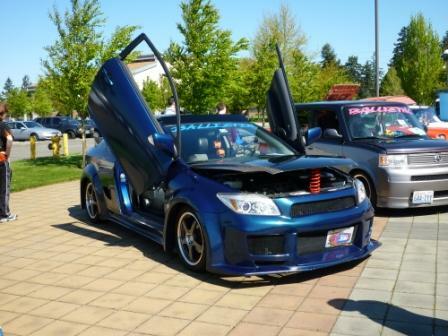 The car had its problems and was expensive to boot, around $25,000 to $27,000. However, I learned about a man, Steven Wynn, who now owns the Delorean Motor Company and is fixing the problems that the Delorean originally had, such as the steel frame with a epoxy coating cracking which actually sped up the rusting process. The video below is from Jay Leno's Garage where Mr. Leno has a interview with Mr. Steven about what he is doing to fix these cars up and about the car itself. It's 15 minutes long but if you have the time it is a very fascinating and enlightening video. 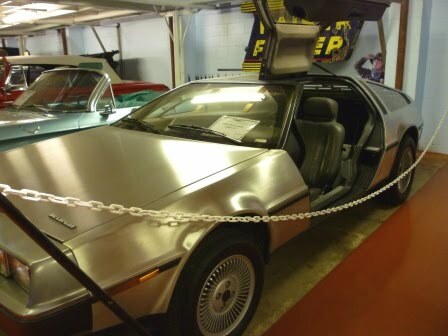 And of course I had to throw in a little "Back to the Future" movie memorabilia that was behind the Delorean in the Museum- As it was the movie "Back to the Future" that helped a new generation discover and appreciate this car. I hope you enjoy this post and learned a little something about the Delorean. A 1937 Fiat Topolino - a small and cute classic auto car. 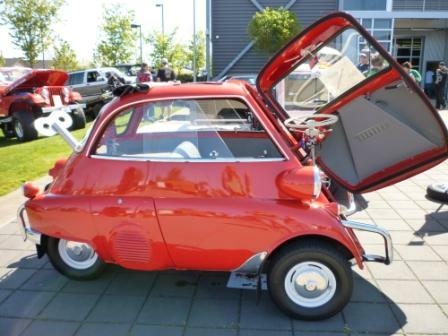 It gets pretty good gas mileage, around 39- 50 mpg ( I know this is a very wide range but it came in about three different models/ styles - the Topolino 500, 500B and the 500C ). I took notice of this car for two reasons. First, because it is cute ( Topolino is Italian for "little mouse") and what really amazed me about it was the fact that the engine is so small (13.5 horsepower) but can go up to around 50- 60 mph! 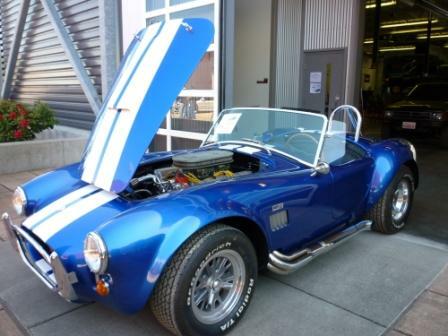 Below is about a two minute video from Jay Leno's Garage on this car. What I found interesting is when Jay Leno opens the hood and shows just how tiny the engine was and how far forward it was on the car providing the driver with tons of leg room. 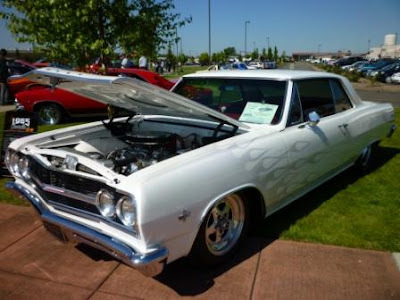 If you want to see this car in person and you are ever are in Tacoma, WA area come check this car out at LeMay - America's Car Museum in the Green room. This link also provides more information about the fiat topolino. I hope you have enjoyed this post. Next I will be writing a post about Harley-Davidson motorcycles.